Confession: Yesterday was the first time I've sewn a stitch in about 2 weeks. If you follow me on Instagram, you know my family spent the last week at Disney. The week before that, I was in full vacation-prep mode. So when I finally sat back down at my machine, I decided a mini quilt was a great project to freshen myself back up. I still need to add the binding, but it's almost there. It measures 20" x 20". Are you interested in joining in the Modern Mini fun? (And yes, there are prizes!) Challenge yourself and try something new: a new technique, a new pattern, a new quilting style, new type of fabric, etc and make a mini quilt. The details: You can enter any mini quilt that you've made within the past 6 months. Remember, a mini quilt can be a mug rug, a mini quilt, a pillow, a table topper, etc. Only one entry per person. Size requirements: Mini Quilt must be at least 6" x 6" and no bigger than 24" x 24". Get inspired at the blog hop stops and then start sewing! 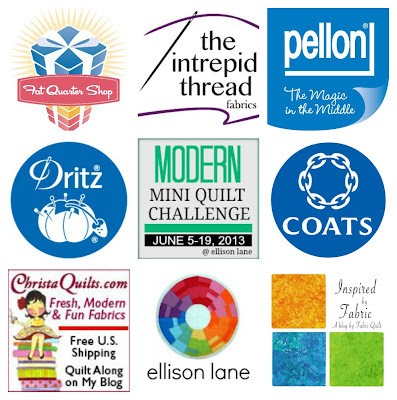 June 5: Ellison Lane Quilts and Happy Quilting June 7: Swim, Bike, Quilt June 8: Craft Buds June 9: From the Blue Chair and Sewing Under the Rainbow June 10: The Sewing Chick June 11: Flying Blind on a Rocket Cycle and Me! Starting June 12, you'll be able to link up your entry at Ellison Lane. You'll have until 5:00 PM EST on June 16 to add your mini quilt. Link from your blog (a NEW post please), your Flickr account or your Threadbias account. Remember, you don't have to have a blog to enter. The $125 Gift Certificate winner will be chosen by Jennifer's husband - his is the Wild Card Choice! The other prizes will be awarded by random draw.